Topics: Termites, Roaches, Fleas, Ants, Bees And Wasps, and Mice And Rats. It is hosted by Theplanet.com Internet Services Inc (Texas, Houston,) using Apache web server. 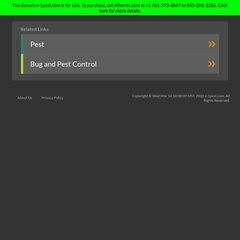 A-1pest.com's IP address is 174.120.23.90. ns922.websitewelcome.com, and ns921.websitewelcome.com are its DNS Nameservers. PING (174.120.23.90) 56(84) bytes of data.